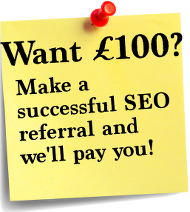 Lead by an ex-Google employee, we specialise in helping businesses increase profits. Need more customers? Need a website that ranks highly? Then you're in the right place. We rank Websites highly across the UK, we build new websites or carry out SEO (Search Engine Optimisation) on your existing site. A higher Google rank = more website views = increased sales! We help your business bring in the money, get new customers and help you grow. 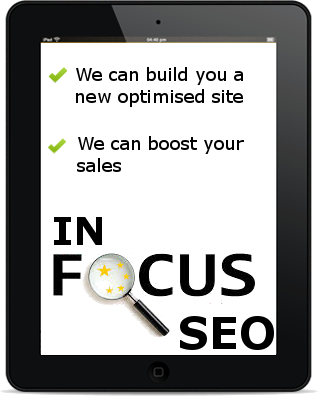 How our SEO and websites help companies and businesses. We provide our customers with first class customer service and advice. No company is an island. We make it possible for your customers to find you. Before working with us, some of our customers have been incredibly frustrated. These include, Solicitors, plumbers, builders, dentists, they’ve all had the same problems. They’ve put their hard earned money into creating the best business they can, they’ve got the tools, stock and premises and are raring to make money but the phone just isn’t ringing. Until they worked with us. What they were lacking is a truly credible internet presence. We’ve found that many of our customers already had websites but they were buried on page 2, 3, 4 and 5 of Google, in other words, they were invisible. We changed this, we boosted sales and made sure their customers could find them. Their competitors were getting the business while they struggled. The graph to the left clearly shows that if you’re not in the top 15 search results, then you may as well not have a webpage at all! We can help you rank highly, above your competitors. So how do we help your business? We talk to our customers and find out exactly what they do and what their selling points are. We evaluate the competition. We use our tools to find out why they are ranking above you on Google and exactly how they are doing it. We assess your site and either suggest changes or carry them out for you, alternatively we can build an entirely new optimised website for you. We then tailor our SEO strategy (search engine optimisation) and work to rank you above your competitors – more on this below. We send you monthly reports on the progress we’ve made and what we’ve been doing. We provide you with the best ongoing customer service, got a question? We’ll answer it. What is SEO and what exactly are we doing to help our customers? If you’re not familiar with search engine optimisation (SEO) it could sound mysterious and confusing. It’s really not. There are two sides to it. On-site and off-site SEO. This is where we get your house in order. Your website must include the right keywords in it’s title and headings in exactly the right amount. You must have unique valuable content and the right amount of it for the search engines such as Google and Bing to find. Things such as page loading times, page layout and the use of social media also needs to be correct in order to make your webpage effective. This part of SEO is essential. We can do all this for you on your existing site or we offer to make you a brand new fully functional site that’s optimised for mobile phones too. Either way, we make sure that your website is ready to rank above your competitor’s. Here’s the tricky part. Google uses an extremely complicated Mathematical forumla to decide whose page should be top of their search results. It relies on ‘social proof‘ to decide if your site is important or not. ‘Social proof’ is in essence what Google thinks of the other websites that link to yours. Do you have industry leaders and established webpages linking to your website? If so then Google probably likes your website and ranks it highly. As you’re reading this we’ll assume not…this is where we come in. As well as making your website Google friendly, we build relationships with existing websites, publish articles on your business area that establish you as an authority, utilise social media to drive people to your site and a few other techniques that we’ve developed. Now there are a lot of other SEO companies out there that use questionable tactics to achieve short-term high rankings on Google. We often find that our customers have been burned in the past by other companies that promise the Earth and deliver very little. Very often these companies actually end up doing more harm than good as Google can penalise websites and disqualify them from their search results. What we do is build a permanent and long lasting reputation around your business that means your site will be safe from these penalties. We rank you above your competitors and make sure you stay ranking above them. 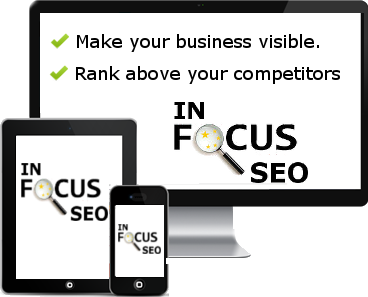 In Focus SEO helps business get more customers and make more money by boosting their Google rankings. 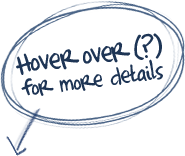 We can design you a pixel perfect website that engages your customers and works on mobile and tablet devices.